People stare, mouth agape and eyes wide, whenever Alan Griffith goes out in public — whether he’s having lunch with his 6-year-old grandson at school or taking a stroll on the boardwalk in Ocean City, but he’s used to it. In fact, he encourages it. He’s the “Tattoo Man,” covered in brilliant colors and fascinating vignettes. His face draws the most looks — covered in creepy crawlies and green ink that glows under a black light. Playful mice cavort across his chest, disturbing faces swirl up his arm, and spiders and snakes crawl across his bald head and down his face and neck. Scary clowns, a snarling wolf and other scenes, both delightful and disturbing, are permanently inked into more than 70 percent of the skin on his body. The 65-yearold retired highway worker plans to have 100 percent of his body covered by the time he reaches age 70. “I like things that people are a little bit afraid of,” said Griffith, who grew up in and around Carroll County and currently lives just over the state line in Pennsylvania. He pointed out one of the screaming faces on his forearm that many people might look at as disturbing. “This one looks a lot like my dad,” he said, affectionately describing the way his father would yell at him to get down from a precarious perch. Griffith has another tribute to his late father on his leg — an intricate scene that includes some of the man’s favorite things, including a race car and Woody Woodpecker. A tribute to Griffith’s mother pays homage to her love of fishing and roses. The central image is framed by a rose wreath, which in turn is surrounded by five fish, each containing the initials of one of her children. Griffith’s sentimental side is further depicted on his back. “My whole back is like a family tree,” he said. holding balloons. Each balloon contains the name of one of Griffith’s two children or nine grandchildren. out of room,” he said. characters including Spider-Man and the Hulk. The Spider-Man head covers another tattoo, Griffith’s first tattoo and the only one he has ever covered up. It is the initials of his first girlfriend. “The only thing I regret about the initials was it wasn’t done by a professional,” said Griffith about the tattoo he lived with for more than 40 years before covering it up. When he was young, Griffith said he doodled all the time. Some of the pages he said he saved for years. “I have always been fascinated by art,” Griffith said. He said he has about $35,000 worth of artwork decorating his body. He gets more out of his pieces, he said, than traditional art collectors because he gets to take it everywhere he goes. He said he gets to appreciate it and share it with the world continuously. “My body is my canvas,” he said. Tattooing has been done since prehistoric times, Griffith said. he said, referring to the practice among some ancient civilizations of displaying the tattooed heads of their enemies. Griffith said he would like to get one small tattoo done using the ancient method of hand tapping with two sticks. That may have to wait a little while, he said, because it’s really expensive and hard to find someone proficient in the method. In the meantime, he is preparing to have alien eyes tattooed just above his own eyelids. He has been frequently shaving his eyebrows to toughen up the skin in that area. The eye tattoos are something he has been planning for years and he said he is finally ready. Griffith said he didn’t have any tattoos visible outside his clothing during the 30 years he worked for the Maryland State Highway Administration. “Then I kind of went ballistic,” he said. Griffith said an elderly lady once approached him on the boardwalk and asked if his mother knew what he had done. He said people sometimes ask to be seated away from him in restaurants. But often, after one curious onlooker comes to say hello, the floodgates open and many more people want to hear about his unique art. He said once people realize how approachable he is and how much he loves to talk about his unique artwork, they come in swarms. His other piece of advice is to vet the tattoo artist. 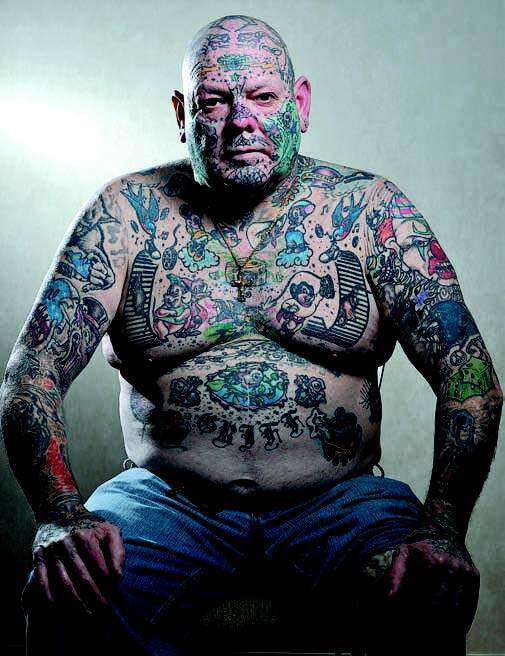 He is not a fan of tattoo parties or tattoo artists who want people to just pick something off the wall. Griffith has only used four tattoo artists in his life. Although he often visits shops wherever he travels, just to check them out. He said he once went to his regular tattoo studio in Delmar, Del., and was surprised to find a guest artist there. He said the guys at the shop talked him into giving the guy a chance and then laughed when he was finished because Griffith didn’t realize it was Chris Garver of the television show “Miami Ink” who had just inked spiders on his face and neck.